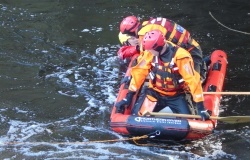 The team currently has 10 Swift Water Rescue Technicians (MOD3) capable of carrying out water entry rescue techniques in both water and flood incidents, who are supported by a further 12 (MOD 2) Water Responders providing bank side support. 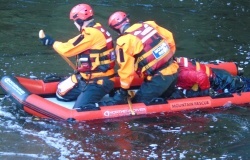 With training costs and the purchase of specialist water equipment including a rescue sled, aluminium boat and trailer modifications, dry suits and water proof radio communications, the team has invested approximately £13,000 to date on its swift water flood rescue capability. This means the team are in a strong position to meet the calls for assistance from the statutory emergency services and to help the communities both locally and further afield. 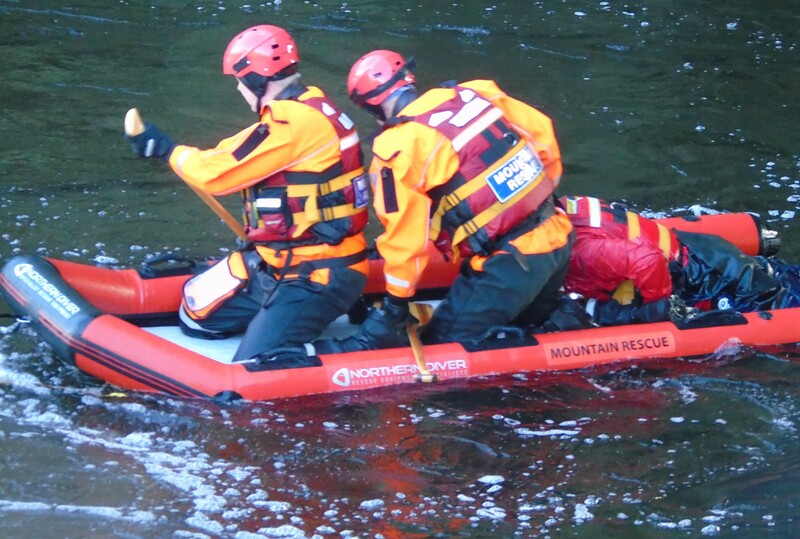 On Sunday 4th December, as most folk enjoyed the Christmas Market in Sowerby Bridge, our water rescue members braved the chilly waters at the canoe course on the River Calder to refresh their water rescue skills. Water environments are very dangerous, demanding places and require a high level of skills to be maintained. 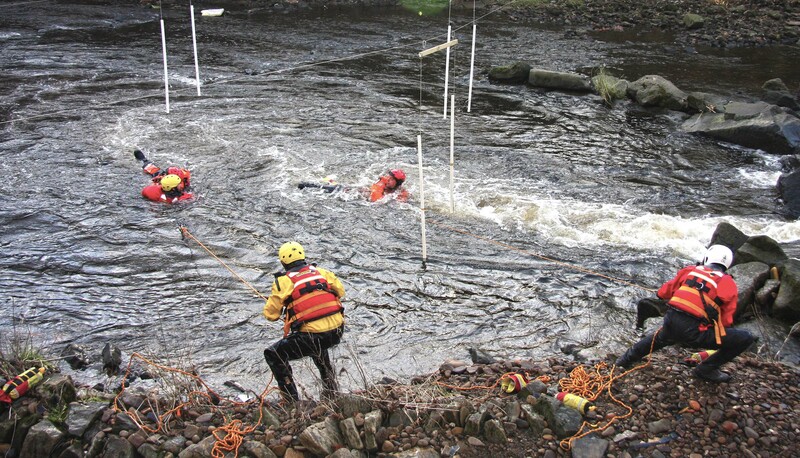 During the day, water team members carried out refresher training of basic survival skills including defensive swimming and self-rescue using the river hydrology through the flows of the canoe slalom course. 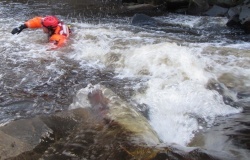 Whilst river levels appeared low, there was still plenty of current along the course to challenge the group. 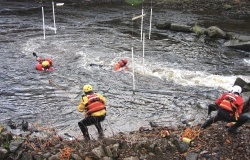 The water team then moved onto rescue techniques including throw line rescue, wading and tethered swim rescues. 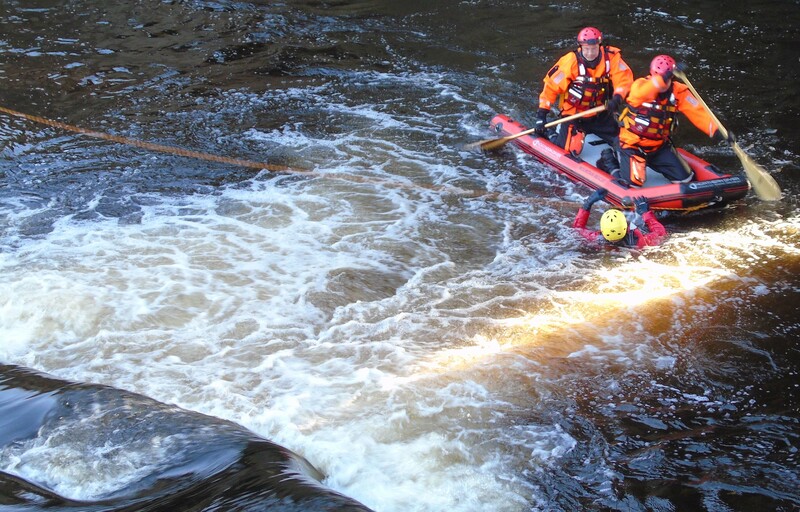 As a result of experience gained during the floods in Cumbria and the Calder Valley, team members practiced the extraction of a non-walking casualty across fast flows using a wading formation to protect the casualty whilst providing stability. 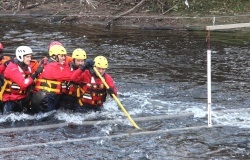 The team also had the opportunity to train using their new Northern Diver rescue sled to affect the rescue of casualties from the water. There was also time to practice water based bank searching, which the team is sometimes tasked to do in the search for missing persons. Probationary members also had the opportunity to experience the challenges of a water environment as they were put through their paces swimming in the river flows. Our sincere thanks to all our generous benefactors who make it possible for us to continue to grow and develop the teams specialist skills to assist partner services and safeguard the community. We would also like to thank Halifax Canoe Club for kindly allowing us to use their excellent club facilities, which also give members a respite from the chilly waters. We wish everyone a safe and very Merry Christmas.